One of the odd aspects of our wars — often seen in the comments on the FM website — is that the critics tend to rely on official US documents (and history), while the pro-war folks tend to rely on their analysis (mostly confidence and hope) with little use of hard data. This post continues that tradition, looking at the latest US government data on the Afghanistan War. Like most official reports, it is a hybrid of mostly bad to neutral data (reflecting past events) and descriptions of current/planned programs (optimistic expectations for the future). Here are a few general observations. The report’s data consists to a large extent of public opinion polls. These are often unreliable in the US. We can only guess at their accuracy in a war zone. The can-do perspective is delusional. Many of these goals would be unrealistic if attempted in an American city, as we know from our 5-decade long War on Poverty. Success is assumed. There is no attempt to describe the level of effort and time required to reach our objectives, nor the odds of doing so. Some excerpts follow. They’re well worth reading. Here is the transcript of the press briefing. While the overall trend of violence throughout the country increased over the same period a year ago, much of this can be ascribed to increased International Security Assistance Force (ISAF) activity. Polls consistently illustrate that Afghans see security as improved from a year ago. At the same time violence is sharply above the seasonal average for the previous year – an 87% increase from February 2009 to March 2010. … On March 31, 2010 there were approximately 87,000 U.S. forces and approximately 46,500 international forces in Afghanistan. Additional U.S. forces are on schedule to arrive in Afghanistan on time to meet mission requirements, with force levels expected to approach 98,000 by August 2010. As of March 31 approximately 113,000 Afghan National Army (ANA) and 102,000 Afghan National Police (ANP) have been fielded. The Afghanistan National Security Forces (ANSF) are broadly on track to meet targeted growth figures of 134,000 ANA and 109,000 ANP by October 2010 and 171,600 ANA and 134,000 ANP by October 2011. 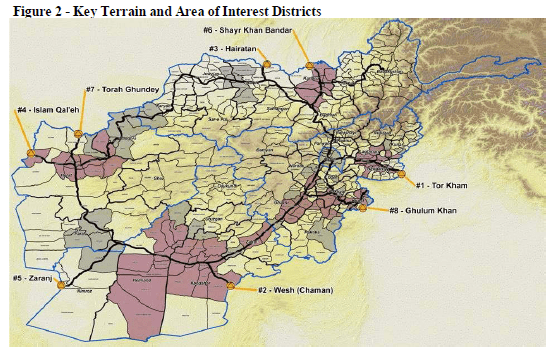 … ISAF and Afghan Government planning teams identified 80 districts as key terrain. In general, key terrain – defined in military terms as those areas that afford a marked advantage to whichever party controls them – are those districts where the bulk of the population is concentrated, and that contain centers of economic productivity, key infrastructure, and key commerce routes connecting such areas to each other and to the outside world. These districts roughly follow the line of the three major highways in Afghanistan through the most densely populated portions of the country. Strengthen the capacity of Afghanistan’s security forces and the Afghan Government so that they can take lead responsibility for Afghanistan’s future. An effective partnership with Pakistan. The U.S. Government will conduct an assessment of progress toward meeting our strategic objectives by December 2010. Requirements of this Section are met by the section 1231 report in Part Two of this document. The insurgents perceive 2009 as their most successful year. Taliban leader Mullah Omar’s recent directives reiterated prohibitions regarding mistreating the population, taking children to conduct jihad, searching homes, kidnapping people for money, and other activities that could turn the population against the Taliban. Expanded violence is viewed as an insurgent victory, and insurgents perceive low voter turnout and reports of fraud during the past Presidential election as further signs of their success. 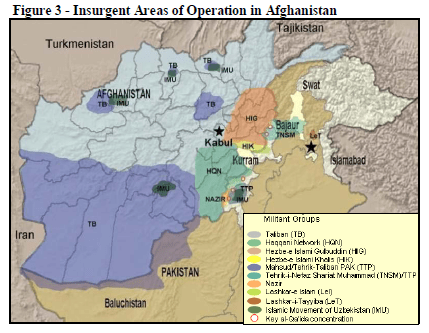 The Afghan insurgency has a robust means of sustaining its operations. Small arms weapons and ammunition are readily available throughout the region, in addition to sources of improvised explosive devices (IED) and home-made explosive materials and technology. External funding is top-down, while internal funding is bottom-up, providing the Taliban consistent streams of money to sufficiently fund operations. Internally, a significant portion of funds are derived from taxing the opiate trade. Externally, funding originates in Islamic states and is delivered via couriers and hawalas.5 A ready supply of recruits is drawn from the frustrated population, where insurgents exploit poverty, tribal friction, and lack of governance to grow their ranks. At this point, the insurgency exhibits several strengths and weaknesses. The speed and decisiveness of insurgent information operations and media campaigns remain not only the insurgents’ main effort, but also their most significant strength. Organizational capabilities and operational reach are qualitatively and geographically expanding. The ability to intimidate through targeted killings and threats in order to force acquiescence to their will. The strength and ability of shadow governance to discredit the authority and legitimacy of the Afghan Government is increasing. IED use is increasing in numbers and complexity; IEDs are as much a tactic and process as they are a weapon. Insurgents’ tactics, techniques, and procedures for conducting complex attacks are increasing in sophistication and strategic effect. The insurgency includes multiple locally-based tribal networks, as well as layered command structures, which at times can make decentralized execution difficult. Persistent fissures among insurgent leadership persist at the local levels. The insurgency is dependent on many marginalized / threatened segments of the Pashtun population. … The insurgency is comprised of multiple groups pursuing various short- and longer-term goals. They are part of a broader syndicate of extremist groups including al Qaeda, Pakistani Taliban, and Lashkar-e Tayyiba (LeT) that threatens security in Afghanistan, Pakistan, India, and elsewhere. The three major groups include the Quetta Shura Taliban, Hezb-e Islami Gulbuddin (HIG), and the Haqqani Network (HQN). These groups cooperate and coordinate at times and their areas of operations tend to be geographically and demographically determined. They operate mainly in the Pashtun-majority areas of Afghanistan in the south and east, and in Pashtun pockets in the north. The common goals of these groups are to expel foreign forces from Afghanistan (although there is no mention of foreign fighters allied with them or al Qaeda) and to undermine the central government. Capable ministry executives and civil servants are vital to increasing and improving the capacity of the Afghan Government at the national and sub-national levels. Significant progress in this area is not achieved in months but in years. Currently, the Government of Afghanistan, United Nations, and donor community collaborate on programs to assist in policy reform, organizational reform, and the reformation of public administration systems. These initiatives are vital to the Government of Afghanistan’s efforts to gain the trust of the people of Afghanistan and to strengthen its legitimacy both domestically and internationally. Some of the reforms are focused on implementing the systems and processes that will enable sustainable long term growth of the ministries and the permanent staff of the ministries. Afghan perceptions of the ability of the government to deliver services will assist in ensuring that the Afghan people will accept the Afghan Government as a culturally and ideologically acceptable government. However, it is crucial to recognize that what is appropriate for the international community may not be the best solution for Afghanistan, due to social, cultural, and economic differences. As of the end of the reporting period this remains an area of challenge and risk. Afghanistan reported in late January 2010 that its budget revenues from March 21, 2009 to March 21, 2010 were likely to be in excess of the 54.5 billion Afghanis (an estimated $1.1 billion) target set by the IMF. Estimates from Afghanistan’s Ministry of Finance project that revenues are likely to top 64 billion Afghanis (an estimated $1.3 billion) – 17% more than target and 60% over 2008-2009. Customs revenue makes up 39% of all Afghan Government revenues. The Afghan national budget deficit grew again during the fourth quarter of 2009, with revenue now covering only 30.3% of expenditures.23 The Afghan Government has become increasingly more dependent on contributions from the international community to sustain deficit spending. With the increase in the size and capabilities of the ANSF comes considerable concern about the ability of the Government of Afghanistan to sustain the ANSF. The Government of Afghanistan will be dependent upon considerable international support for the foreseeable future, although efforts continue to increase the Afghan budget revenue. The Afghan Government included approximately $455 million of funding in its Solar Year 1389 budget (covering March 2010 to March 2011) which is an increase of $140 million over the past year. Although this is only a small portion of the cost for ANSF development, it is over 30% of total Afghan Government revenues, and shows progress on the part of the Afghan Government. Afghanistan’s mobile phone penetration is estimated at close to 40% of the population, and is quickly growing. To date there are over 12 million cell phone accounts in Afghanistan, a country of 29 million people. Mobile phones account for 99% of all communication lines employed. The mobile phone market also serves as the country’s largest taxpayer, employs more than 100,000 people, and generates as much as $1 billion in annual revenue for the country’s five operators. The CN Strategy reflects lessons learned from CN activities from 2004 through 2008 —the most significant being that large-scale eradication targeted toward Afghan poppy farmers was counterproductive and drove farmers to the insurgency. The new strategy places primary focus on interdiction of the nexus between narco-trafficking and the insurgency, but also places a heavy emphasis on agricultural assistance to farmers, with the aim of transitioning them to licit crops, creating jobs, and revitalizing Afghanistan’s historically vibrant agricultural sector. There are no excerpts from Part 2 — United States Plan for Sustaining the Afghanistan National Security Forces. It’s too delusional, hence depressing. To read other articles about our wars, see Iraq and our other wars – my articles. Important news: “Major discovery: a purpose of the war in Afghanistan“, GLenn Greenwald, Salon, 16 September 2011 — A brief analysis showing the madness of our war in Afghanistan.